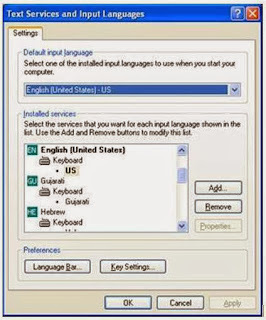 Solutions Tricks Unicode How to enable hindi (Devanagari) input in windows 8,7,vista and xp. 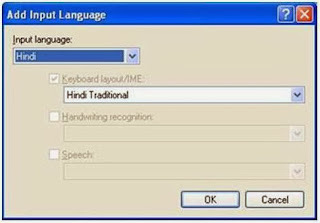 How to enable hindi (Devanagari) input in windows 8,7,vista and xp. Is this possible to give input in Hindi script without any external software help in windows platform running systems. Then answer is yes. Many times we face problem in typing in Hindi when we don't know how use our keyboard for Devanagari script input. Many websites and softwares provide typing test in Hindi, when you have not enabled Hindi in your system then you can't give input in devanagari script. 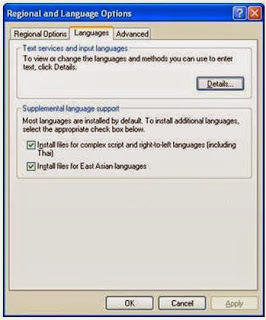 Here is given simple way of enabling Devanagari script in windows 7, vista and xp. 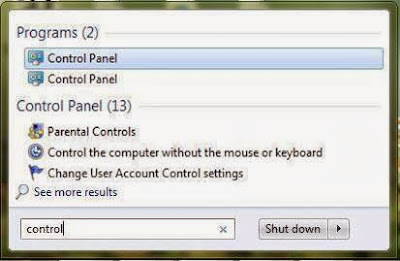 Simple way just type control panel in start search button. Now click on control panel option and open it. Find the clock, region and language option. 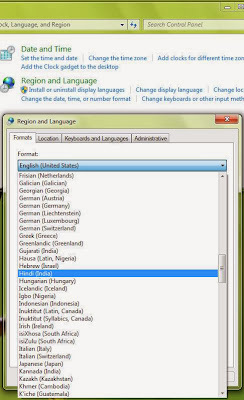 You will see a new window in this window click on region and language option. Now a new window appears, where format option is available in tabs. Now you can select your desired regional language. Click on Hindi to enable it. Under the heading 'Standards and format' select Hindi or any other language as your User Locale from the drop-down box. This selection will determine settings for numbers, currencies, times and dates as well as sorting rules for the language.  In the drop-down box select Hindi or Marathi as the Input Language. The Hindi-Traditional and Marathi keyboard contain all the characters that are traditionally used in Hindi and Marathi and include English punctuation without the need to change to the English keyboard to get at the punctuation. It is the recommended keyboard for most users. The Devanagari inscript keyboard contains an extended Devanagari character set that includes characters for transliterating into Devanagari from other Indian languages as well as some Sanskrit and ancient Vedic characters. This keyboard is recommended for special users.